The electorate in last year’s presidential election was the most racially and ethnically diverse in U.S. history, with nearly one-in-four votes cast by non-whites, according to a new analysis of Census Bureau data by the Pew Research Center.1 The nation’s three biggest minority groups—blacks, Hispanics and Asians—each accounted for unprecedented shares of the presidential vote in 2008. Overall, whites2 made up 76.3% of the record 131 million people3 who voted in November’s presidential election, while blacks made up 12.1%, Hispanics 7.4% and Asians 2.5%.4 The white share is the lowest ever, yet is still higher than the 65.8% white share of the total U.S. population (Pew Hispanic Center, 2009). The unprecedented diversity of the electorate last year was driven by increases both in the number and in the turnout rates of minority eligible voters. The levels of participation by black, Hispanic and Asian eligible voters all increased from 2004 to 2008, reducing the voter participation gap between themselves and white eligible voters. This was particularly true for black eligible voters. Their voter turnout rate increased 4.9 percentage points, from 60.3% in 2004 to 65.2% in 2008, nearly matching the voter turnout rate of white eligible voters (66.1%). For Hispanics, participation levels also increased, with the voter turnout rate rising 2.7 percentage points, from 47.2% in 2004 to 49.9% in 2008. 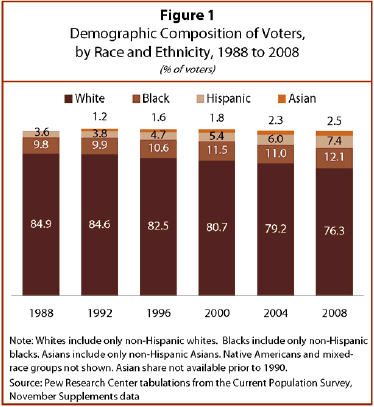 Among Asians, voter participation rates increased from 44.6% in 2004 to 47.0% in 2008. 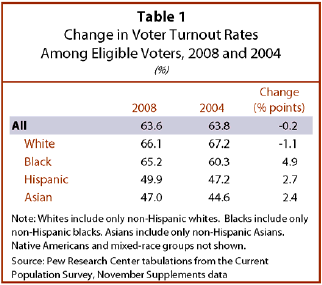 Meanwhile, among white eligible voters, the voter turnout rate fell slightly, from 67.2% in 2004 to 66.1% in 2008. Much of the surge in black voter participation in 2008 was driven by increased participation among black women and younger voters. The voter turnout rate among eligible black female voters increased 5.1 percentage points, from 63.7% in 2004 to 68.8% in 2008. Overall, among all racial, ethnic and gender groups, black women had the highest voter turnout rate in November’s election—a first. Blacks ages 18 to 29 increased their voter turnout rate by 8.7 percentage points, from 49.5% in 2004 to 58.2% in 2008, according to an analysis by the Center for Information and Research on Civic Learning and Engagement (CIRCLE) at Tufts University. The voter turnout rate among young black eligible voters was higher than that of young eligible voters of any other racial and ethnic group in 2008. This, too, was a first (Kirby and Kawashima-Ginsberg, 2009). The increased diversity of the electorate was also driven by population growth, especially among Latinos. Between 2004 and 2008, the number of Latino eligible voters rose from 16.1 million in 2004 to 19.5 million in 2008, or 21.4%. In comparison, among the general population, the total number of eligible voters increased by just 4.6%. Voting Age Population: The population of persons ages 18 and older. Voting Eligible Population: Persons ages 18 and older who are U.S. citizens. 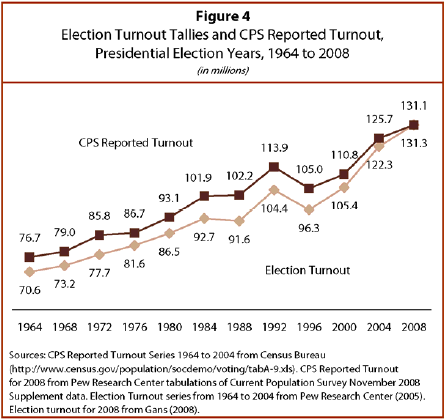 Voter Population or Voter Turnout: Persons who say they voted in the November 2008 election. Voter Turnout Rate: Share of the voting eligible population who say they voted. In 2008, Latino eligible voters accounted for 9.5% of all eligible voters, up from 8.2% in 2004. Similarly, the share of eligible voters who were black increased from 11.6% in 2004 to 11.8% in 2008. 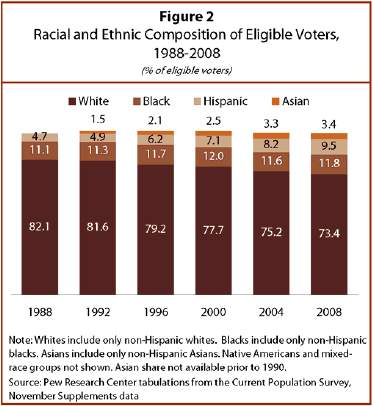 The share of eligible voters who were Asian also increased, from 3.3% in 2004 to 3.4% in 2008. In contrast, the share of eligible voters who were white fell from 75.2% in 2004 to 73.4% in 2008. 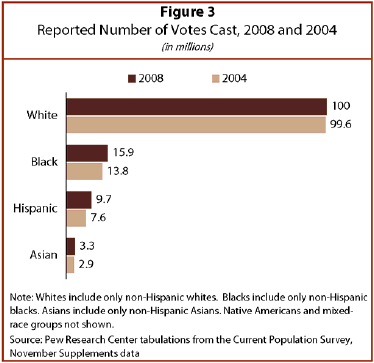 With population growth and increased voter participation among blacks, Latinos and Asians, members of all three groups cast more votes in 2008 than in 2004. Two million more blacks and 2 million more Latinos reported voting in 2008 than said the same in 2004. Among Asians, 338,000 more votes were reported cast in 2008 than in 2004. The number of white voters in 2008 was also up, but only slightly—increasing from 99.6 million in 2004 to 100 million in 2008. According to the exit polls in last year’s presidential election, the candidate preference of non-white voters was distinctly different from that of white voters. Nearly all (95%) black voters cast their ballot for Democrat Barack Obama. Among Latino voters, 67% voted for Obama while 31% voted for Republican John McCain. Among Asian voters, 62% supported Obama and 35% voted for McCain. In contrast, white voters supported McCain (55%) over Obama (43%). This report summarizes the participation of voters in the 2008 presidential election and follows reports from the Pew Hispanic Center, a project of the Pew Research Center, on the Latino vote (Lopez and Livingston, 2009; Lopez, 2008; Taylor and Fry, 2007) and Latino public opinion about the election and the candidates (Lopez and Minushkin, 2008). The data for this report are derived from the November Voting and Registration Supplement of the Current Population Survey (CPS). The CPS is a monthly survey of about 55,000 households conducted by the Census Bureau for the Bureau of Labor Statistics. The November Voting and Registration Supplement is one of the richest sources available of information about the characteristics of voters. It is conducted after Election Day and relies on survey respondent self-reports of voting and voter registration. The Census Bureau’s biannual Current Population Survey November Voting and Registration Supplement is the most comprehensive data source available for examining the demographic composition of the electorate in federal elections. However, because it relies on post-election self-reporting by survey respondents in some 55,000 households, these weighted CPS estimates of turnout never match up precisely with the actual number of votes tallied in the 50 states. According to the CPS, an estimated 131.1 million U.S. citizens voted in the 2008 presidential election – slightly less than the 131.3 million votes cast for president, as reported by the Center for the Study of the American Electorate (Gans, 2008) and other sources (McDonald, 2009). This is the first time since the Census Bureau began taking a post-election survey in 1964 that its estimate is smaller than the number of votes tallied by the states. Prior to 2008, the gap had always run in the opposite direction, with variances ranging between a low of 2.8% (in 2004) and a high of 11.6% (in 1988). Since the 1996 presidential election, the gap has narrowed steadily, and in 2008, the lines crossed for the first time. Election experts and scholars who have examined this gap over the years have theorized that it stems, at least in part, from a tendency of some Census Bureau survey respondents to report that they had voted even if they had not (Bernstein, Chadha and Montjoy, 2001). Another possible explanation is that in every election, some small portion of ballots are improperly cast and do not become a part of the official count—but the voters who cast such ballots report to the Census Bureau that they had voted. There is no consensus among experts to explain the recent convergence in the number of votes tallied by the states and those reported by the Census Bureau. One possibility is that there has been a decline in spoiled, uncounted ballots in recent elections. Another possibility is that there has been an increase in voting by U.S. citizens living abroad – a group that is not included in the CPS survey (McDonald, 2009). A third possible explanation is that the accuracy of the CPS itself may have improved. This report summarizes the participation and characteristics of voters in the 2008 presidential election. The data for this report are derived from the November Voting and Registration Supplement of the Current Population Survey. The CPS is a monthly survey of about 55,000 households conducted by the Census Bureau for the Bureau of Labor Statistics and the Census Bureau. The November Voting and Registration Supplement is one of the richest sources of information about the characteristics of voters available. It is conducted after Election Day and relies on survey respondent self-reports of voting and voter registration. The terms “Latino” and “Hispanic” are used interchangeably in this report. The terms “whites,” “blacks” and “Asians” are used to refer to the non-Hispanic components of their population.